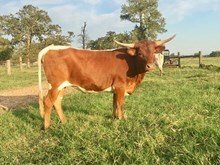 ECR Piasano's Girl is a great El Coyote bred longhorn cow. She has famous cows like Delta Vixen on the top and Delta Disco on the bottom. This cow will produce consistently and we have retained a very nice 2017 heifer from her.